F&F Paving and Excavating provides residential excavating and commercial site work services including but not limited to earth moving, road construction, foundations, drainage solutions, stormwater facility installation and maintenance, retention ponds, berms, swales, grading, drainage pipes, concrete curbs, sidewalks, utility installations, septic systems and much more. 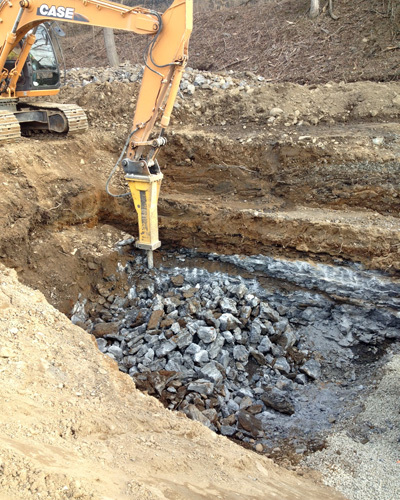 Residential excavating can include any or all of the above services. F&F can help determine the proper course of action providing and quality cost effective solution tailored to your needs. F&F has been the choice for countless local builders and developers for the last 30 years. 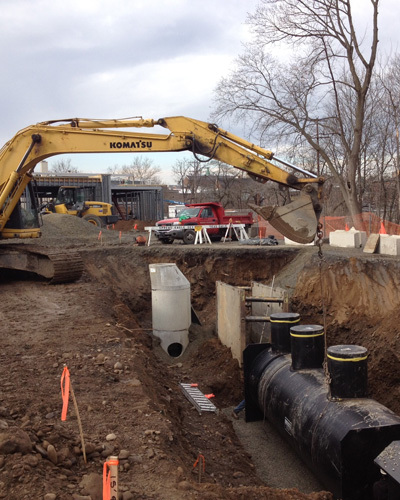 We have installed drainage ditches, storm pipes and utilities for residents across the entire Pocono region. We provide cost effective solutions on the exterior of your home before water can wreak havoc on the interior of your home. For example, a project such as installing a yard drain and culvert pipe or the installation of a drainage swale could redirect water away from your home before it has the chance to enter. We also deliver fill dirt and screened topsoil to dress up your landscape beds and lawns. We deliver to the greater Pocono area by triaxel dump truck. F&F has been locally based in the Poconos and family operated since day one. We provide services to not only our neighbor residents but to our neighbor businesses. Commercial site development has been a part of our business from day one and over the years has seen its fair share of change. With more regulatory requirements and additional permitting commercial site development can be a daunting process. Unexpected lead times due to engineering design, permit acquisitions, municipal approvals, are not uncommon, but can be lessened if the right people are involved. F&F has a good relationship with many local engineers, surveyors and sub contractors to aid the process from the beginning. The key in any site development project is to get out ahead of the process and make informed decisions with the municipalities and governing agencies in mind. F&F can help with those informed decisions, proving input towards the constructability of a project, streamlining the permitting process and getting your new business up and running faster. We can help value engineer a project from a constructability standpoint to aid in the process. Plan reviews, pre construction meetings, even site feasibility.